Park MGM and NoMad Las Vegas are the newest resort experiences to open on the Las Vegas Strip. Park MGM opened in May 2018 with more than 2,700 residential-feeling guest rooms and suites. NoMad Las Vegas opened in October 2018 as the associated luxury boutique hotel within a hotel experience with 293 guest rooms and suites. Everything in Las Vegas is, well… Las Vegas-like, and so has way more than one would expect, even taking Las Vegas into account. So… 77,000 square feet of conference space including an Executive Meeting Center and a selection of high-touch, high-tech meeting venues for small groups called Ideation studios. Meeting space at Park MGM is designed for small groups while also offering the ability to host up to 5,000 attendees in the customizable Park Theater (yes, the Las Vegas thing covers all bases). W Aspen offers 88 guestrooms (including six suites) and 11 W-branded fractional residences plus a 1,600 square foot outdoor patio and a 12,000 square foot rooftop bar and pool, overlooking Aspen Mountain. Cool. I am reluctant to tell you how incredibly beautiful the Sonoma Coast is, because that is where I go when I want to get away and relax… BUT… if you already know what I am talking about (or want to know) you should definitely consider the 46-room Timber Cove, a luxury resort perched (note: marketing word) on the bluffs overlooking the Pacific. It’s about 2.5 hours from San Francisco, 15 miles north of Jenner (where the Russian River meets the ocean) or about one hour from the Sonoma County airport. Zillions of outdoor activities. Check it out. Located in the heart of San Francisco's theatre district and just steps from Union Square, this recently renovated 236-room downtown property offers 3000 square feet of meeting and pre-function space (5 meeting rooms, all on one floor). As an aside… if you want to watch a game (any game), Jasper’s Corner Tap & Kitchen (the hotels bar/restaurant) is the place to watch (12 screens). Granlibakken Tahoe is a conference center that provides an opportunity to meet in a relaxed atmosphere with easy access to everything Tahoe has to offer. The property features 200 rooms (from hotel rooms to multi-room townhouses), 16,000 square feet of indoor meeting space (and lots of outdoor space in summer), and all-inclusive conference packages (if you want them). Put it on your consideration list. I do not know if Oakland is the new Brooklyn yet, but it’s trying. A burgeoning food and entertainment scene is emerging and it’s exciting to watch (and eat). Located in Jack London Square, the Waterfront Hotel is part of the unique atmosphere of the Oakland waterfront and accessible to “stuff”. It offers 145 rooms and suites, many of them with views of the Bay, plus 8100 square feet of meeting space. No getting around it… it’s a special place. Some very smart people took the original Fort Baker, completely renovated the various officer’s quarters, added some brand new rooms too (so now a total of 142), renovated the main buildings to include some great meeting space (14k sq. ft. indoors and another 12.5k outdoors)… and all of this is literally “right there” looking up at the Golden Gate Bridge and across the Bay to San Francisco (so it’s convenient too but you feel like you are far away). It’s cool. South Shore. On the Beach (the name kind of gives that away), their own pier and marina, 260 guest rooms, 3200 square feet of indoor meeting space, 1800 square feet of tented out door space (seasonally available), one mile from skiing at Heavenly, two restaurants, all of that cool Tahoe stuff… and they are pet-friendly. :) Check them out. My most important take-away after visiting this 287-room resort located 29 miles northeast of the San Diego airport? Every staff member we interacted with was super friendly and helpful… my compliments to the GM and the HR department. I will remember. :) Add in 80,000 square feet of meeting space, championship golf, a great Spa, beautiful gardens… and a whole bunch of other cool stuff and you should add it to your consideration set. A zillion team building possibilities. One I liked (because I used to have this huge organic garden and now I live in a flat on Russian Hill in SF and miss having a garden and a dog) is when their chef takes your group out into his huge organic garden, helps your folks pick the freshest ingredients, and then take them back to create “something”… which can be a lot of different things depending upon the season, the size of your group and how much time you have. Add to that… it’s a 170-room AAA Five-Diamond resort & spa with 20k square feet of indoor and outdoor function space located on the Torrey Pines Golf Course just a few minutes drive from downtown La Jolla… and that is all good. The Del is a synonym for iconic. Approaching its 130th anniversary (!) this 28-acre resort is located on what is arguably one of the best beaches in San Diego and offers 679 guestrooms, 78 oceanfront cottages and villas, 65,000 square feet of indoor and outdoor function space, and just about everything else. There is a reason it is an icon. Many (many) group activities are available, including a sailing regatta (right from the property), surfing lessons, or, because they are iconic, anything else you want to create. This historic 114-room landmark boutique hotel, keeps getting better. The next major addition, the transformation of a circa 1905 on-property bungalow into a 3500 square-foot spa. Add that to its prime location on La Jolla’s Prospect Street, it’s fantastic ocean views over La Jolla Cove, beautiful gardens and a great pool, and 4,000 square feet of meeting space. Perfect for a board meeting or small incentive. My kind of place. For those of us fortunate enough to have ever visited Yosemite, you understand that it is one of the best places in the world. As an aside, I plan on having my ashes scattered in Toulumne Meadows (when the time comes, not before). 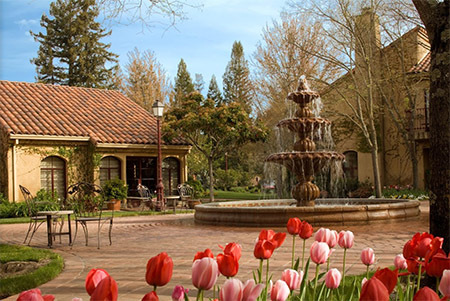 Anyway… Tenaya Lodge is an all-season resort with 240 guest rooms and 57 cottages located just outside the southern Park gate so your group can explore the Park and its surroundings and return to enjoy the resorts many amenities (including 9k square feet of meeting space and a Spa. Think infinite activities. Full disclosure… I was DOS here from 1987-1999 and still have dreams about it… so I think it’s a special place… but it’s not just me… everyone who has ever stayed there thinks the same thing. The facts… 226 guest rooms (many are suites), a 40,000 square foot Spa featuring natural thermal mineral water pools, a “renowned” 18-hole championship course, located in Sonoma Valley (so close to “stuff”), and 10,000 square feet of meeting space (plus additional venue space at the Golf Club). Oh… and it’s a Fairmont. There are not many places quite like the Flamingo. The hotel opened in 1957 and quickly became a society hot spot, the place to see and be seen. In 1959, the Flamingo became renowned by Hollywood as the place to stay north of the Bay. Movie stars like Jayne Mansﬁeld were often found sunning themselves by the pool. Even though the town has kind of grown around the three-star 170-room Resort over the last 60 years, the Resort still has an authentic retro feel. It also offers 15,000 square feet of meeting space AND… an 8,000 square foot Health Club plus a seven-treatment room Spa. Full disclosure… I used to be a member of the Health Club and really enjoyed it. Those were the days I used to take care of myself. I moved away and now I don’t. Advice… do not follow my example. The moment I stepped on to this property located in a grove of Redwood Trees a short walk from the Russian River and the town of Guerneville I thought… oh, this is perfect for a Google group (or its demographic equivalent). 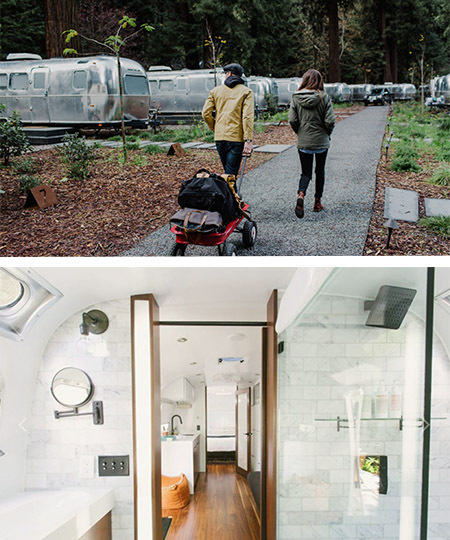 It offers 23 customized Airstream trailers and during the season, 10 additional luxury tent-cabins… plus a big central lawn for the teambuilding thing (plus firepits)… and each airstream has a BBQ… and there is a clubhouse… and other cool stuff. If you have the right kind of group, they will love it. If your group needs a small luxury boutique top-rated 25-room Inn with a Michelin starred restaurant… and quiet and discreet and service (but not rate) are your “hot buttons” and you want to stay at a multi-award-winning Inn owned by a 5th generation Sonoma winemaking family (that knows everyone) in the heart of the Russian River Valley… then this place is for you. Their boardroom comfortably holds twelve… or you can buy out the whole place. Either way… nice. Hyatt Regency Sonoma Wine Country https://sonomawinecountry.regency.hyatt.com/en/hotel/home.html Located in Santa Rosa on the edge of Railroad Square (read shops and restaurants), this convention-style hotel currently has 155 rooms… BUT… is in the midst of a major expansion and is about to have a total of 253 guest rooms and suites. They also offer 10,000 square feet of indoor space and another 10k of outdoor space (with gardens and lawns etc).